Where Did Alexander Hamilton Live While Attending Grammar School in Elizabethtown, New Jersey? © Posted on January 22, 2018, by Michael E. Newton. When Alexander Hamilton arrived on mainland North America in the autumn of 1772 to pursue his education, thanks to money given to him by his cousin, he enrolled in Francis Barber’s grammar school in Elizabethtown (now Elizabeth), New Jersey, later known as the Elizabethtown Academy. He studied at this school from his arrival in October 1772 until he started college in September 1773. 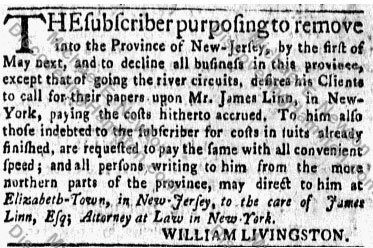 According to John Church Hamilton, his father Alexander Hamilton during his stay in Elizabethtown lived with William Livingston, an esteemed New York lawyer who had come to New Jersey to retire. But where in Elizabethtown did William Livingston live? Presumably, William Livingston and family stayed in this rented house for another year as a new home was being built for the family northwest of town. Thus, when Alexander Hamilton arrived in Elizabethtown in October 1772 and moved in with the Livingstons, they lived in this house rented from Jacob De Hart. But where in Elizabethtown was this house located? 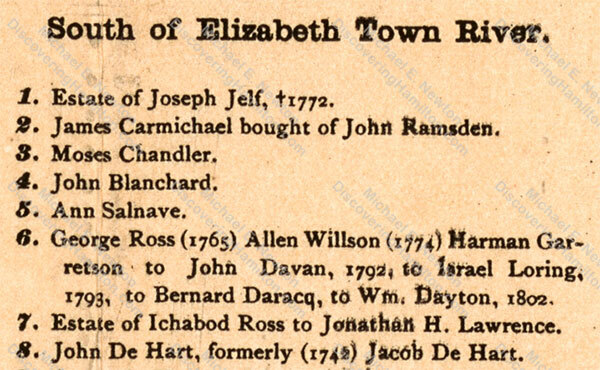 Jacob De Hart owned more than one house in Elizabethtown. One was just south of the stone bridge over the Elizabeth River (at present-day South Broad Street and Pearl Street). The other was a few blocks to the northwest on the west side of the Elizabeth River (at present-day Cherry Street and Rahway Avenue). The former location was just three-tenths of a mile from Elizabethtown’s grammar school. The latter was about six-tenths of a mile from the school. 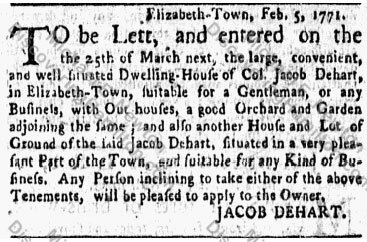 In February 1771, this house was again advertised for lease along with “another House and Lot of Ground of the said Jacob Dehart, situated in a very pleasant Part of the Town, and suitable for any Kind of Business.” This second house is apparently the one south of the river at present-day South Broad Street and Pearl Street. William Livingston could have rented either of these houses from Jacob De Hart. The house on the west side of the river at present-day Cherry Street and Rahway Avenue appears to be the larger of the two. It was farther away from the center of town, but closer to Livingston’s property to the northwest, where he was building a new house. 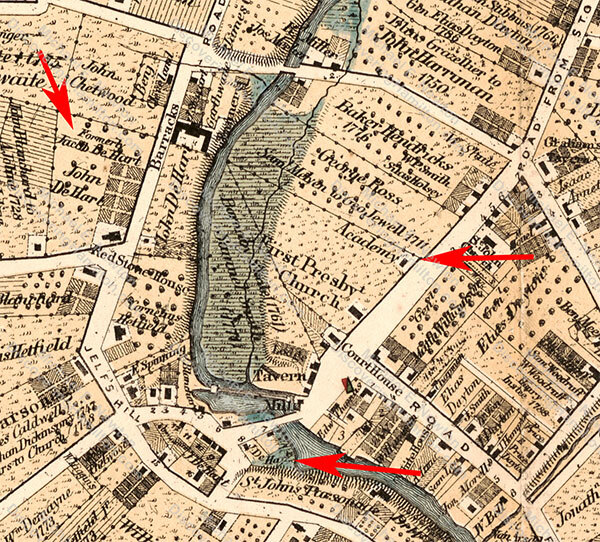 The house at present-day South Broad Street and Pearl Street was not as large but closer to the center of town. It was one of these two houses that William Livingston rented from Jacob De Hart and in which Alexander Hamilton lived for ten or eleven months while attending Elizabethtown’s grammar school. Unfortunately, given the available information, it cannot be determined with certainty which of these two houses Hamilton and the Livingstons lived in. Although there is no record which of the two houses William Livingston rented, we can still analyze the evidence to determine which is more likely. With a wife and nine surviving children, most of whom lived with their parents and those who didn’t presumably visiting often, and taking in at least one boarder, i.e., Alexander Hamilton, it makes sense that Livingston would have rented the larger of the two houses. Being closer to his property northwest of town, where Livingston was building a new house that must have needed his attention, probably also influenced his decision. Thus, it would seem that William Livingston more likely rented the “large, convenient, and well situated Dwelling-House . . . suitable for a Gentleman, or any Business, with Out-houses, a good Orchard and Garden” on the west side of the Elizabeth River (at present-day Cherry Street and Rahway Avenue) and that it was in this house that Alexander Hamilton lived for ten or eleven months while attending Elizabethtown’s grammar school. As mentioned earlier, William Livingston owned property northwest of Elizabethtown, on which he planned to build a new house for his permanent residence. When Livingston moved into the house he rented from De Hart, construction on this house a mile and a half to the northwest of town, to be called Liberty Hall, had not yet begun. William Livingston hired a master artisan in December 1772 to help design the house. Livingston planned to start building in the spring of 1773 and hoped to take up residence that autumn. Construction took longer than expected and he did not move into Liberty Hall until April 1774. On April 28, 1774, a grand event marked the opening of Liberty Hall: the marriage of John Jay to Sarah Livingston, William Livingston’s daughter. By this time, Alexander Hamilton was in school at King’s College in New York City. Perhaps, as a close friend of the Livingstons, he came back to Elizabethtown to attend the wedding of John Jay and Sarah Livingston at Liberty Hall. Newton, Alexander Hamilton: The Formative Years 69. 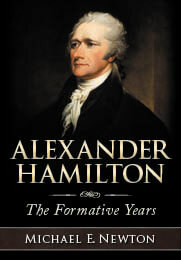 John C. Hamilton, The Life of Alexander Hamilton 1:8; John C. Hamilton, History of the Republic 1:46. Documents Relating to the Colonial History of the State of New Jersey 19:390n. William Livingston to Paparel Bloodgood, December 9, 1772 in The Papers of William Livingston 1:363–364; ibid. 5–6 and 364 note 2. Are the houses still standing?